HOUSTON – NASA's space shuttle Endeavour are wrapping up the orbiter's final mission and preparing to return their spacecraft on Earth for the last time on Wednesday. Endeavour is scheduled to land at NASA's Kennedy Space Center in Cape Canaveral, Fla., early Wednesday (June 1) at 2:35 a.m. EDT (0635 GMT), ending its final 16-day mission to the International Space Station, and bringing its spaceflying career to a close. "It's a big moment in the mission to get safely back to Earth," Endeavour commander Mark Kelly said in televised interviews late Monday (May 30). "I think these guys are looking forward to a soft landing and I'm going try to give them one." Flight controllers are, however, keeping their eye on early weather forecasts to make sure that crosswinds at the landing site do not exceed safety limits, LeRoy Cain, chair of Endeavour's mission management team, said in a news briefing. Endeavour has already been cleared for landing by mission managers at Mission Control in Houston. Kelly, shuttle pilot Greg Johnson and mission specialists Greg Chamitoff, Andrew Feustel, Mike Fincke and Roberto Vittori, carried out a final inspection of Endeavour's heat shield while the orbiter was still docked to the space station. The six-man crew of space shuttle Endeavour discusses the last flight of the shuttle with reporters for one last time on May 29, 2011 before returning to Earth. "We think it's really just an issue with this performance monitor box," lead shuttle flight director Gary Horlacher said. "Looking at the fuel cell performance in real time, the fuel cell was performing great. The next time it ran the self test, it turned out nominal. It's kind of an intermittent indication that we're seeing. The fuel cell is looking fine. Teams are going to continue to watch it and talk about it today." Endeavour undocked from the space station Friday night at 11:55 p.m. EDT (0355 May 30 GMT), after spending 11 days, 17 hours and 41 minutes parked at the orbiting outpost. NASA has two chances to land Endeavour in Florida on Wednesday. If the shuttle misses the first opportunity, the second window opens at 4:11 a.m. EDT (0811 GMT), NASA officials said. After that, the next available opportunities for Endeavour to land would come on Thursday (June 2). If bad weather or other issues prevent a landing at Kennedy Space Center, Endeavour could be waved off to land at backup runways at Edwards Air Force Base in California or at White Sands Space Harbor in New Mexico. This may be Endeavour's final flight, but the orbiter's performance so far has been near flawless, mission managers said. "The performance has been nothing short of outstanding," Cain said. "When I think back to the last couple of years of missions, we've been very fortunate with the performance of the vehicles on orbit. There are still some milestones ahead of us where we've got to continue to stay focused and continue to deal with things as they come, but the performance up until now has been just outstanding." Endeavour has visited the International Space Station 12 times in 25 flights, and delivered and attached the station's first U.S. segment, the Unity node, in December 1998. 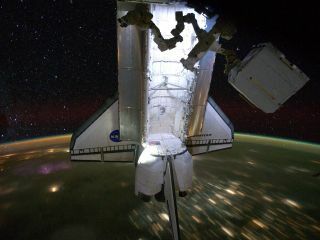 The shuttle continued to play an integral role in the space station's construction over the years, transporting sections of the laboratory's backbone-like truss, solar arrays, the Tranquility module, Cupola observatory, and most recently, a $2 billion astrophysics experiment called the Alpha Magnetic Spectrometer. NASA has one final shuttle mission planned before it brings its 30-year space shuttle program to an end later this year. The STS-135 flight of Atlantis is scheduled to launch to the International Space Station in early July. If Endeavour lands on time on Wednesday, the orbiter will actually touch down at Kennedy Space Center while its sibling, Atlantis, makes its final slow crawl from the Vehicle Assembly Building to the spaceport's seaside launch pad, in preparation for its last mission. Following the retirement of the shuttle program, the orbiters will be processed to prepare them for public display in museums across the country. Endeavour has been promised to the California Science Center in Los Angeles.